Knotting between beads is a method that creates a more professional finish to strung jewelry designs. While it can tax your patience, especially if you don't knot very often, it is well worth the effort. There will be a wonderful drape and flow style to your beads when you are finished. In this project, you can use knots to create an endless beaded design with no clasp. The finished necklace measures 26 inches, and the length can be adjusted by adding or removing beads. If you want it shorter, you'll need to make sure it fits over your head before finishing the final knotting process. For most people, 26 inches will allow the necklace to fall to about the middle of your chest. Consider your frame and several articles of clothing that you plan to wear when you are determining the length you'd like your finished necklace to be. Think about the quality of beads when it comes to symmetry. 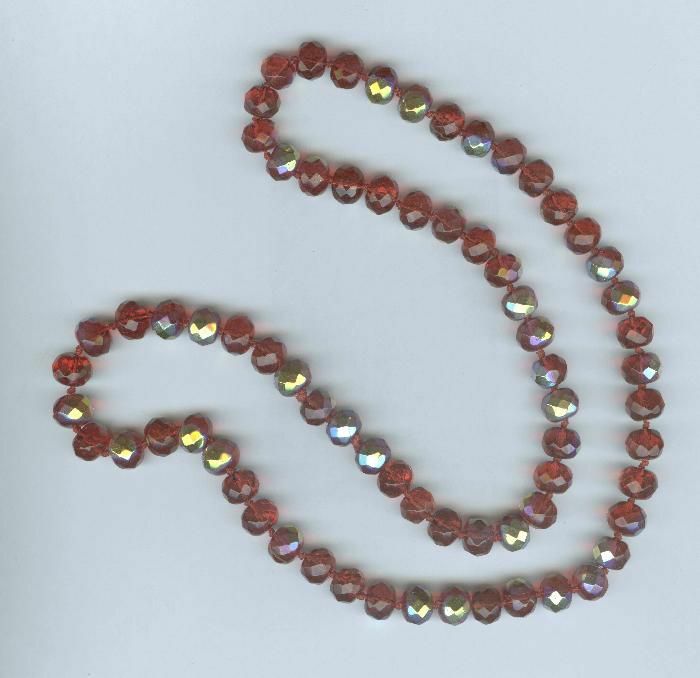 It's possible for you to fall in love with a particular set, such as red crystal aurora borealis beads from Michael's. When selecting beads to knot, it's important to choose wisely because when the holes are overly large, your knots will slip through the hole. Because of bead hole issues or limited stock of nylon cord, you may have to improvise with your strands. For example, you might end up using two strands of size four cording together to compensate for some of the overly large holes. As you strung on beads, make sure you check that the hole will not go over the knot you make. While this takes extra time, perseverance will create great results. However, if you don't have the patience for culling and checking holes as you go, spend the extra few dollars and get higher quality beads. This also means you can use just one strand of nylon cord versus two. Clear drying tacky glue. Any sort of glue that dries clear will work on this. Other than tacky glue, another option is hypo-cement, which is a favorite of many beaders and is available from most jewelry supply vendors. Because there is no clasp on this necklace, you will need to make sure to leave at least six to eight inches of nylon cording at the end of either side of the beads you knot. With this in mind, hold them together and tie an overhand knot about six to eight inches from the end of the cords. Then, slip your first bead onto the two cords. From now on, you will be working with both cords held together as if they were one. Push the first bead down up against the first knot made in the previous steps, and then make a loose overhand knot with the cords. The overhand knot is one of the most important knots that form the basis of many others and is very secure. Reference the image for an example of what an overhand knot looks like. After bead knotting, insert the corsage pin into the knot. Then, push the knot up against the bead. When doing this, make sure the knot is very tight before pulling out the pin. To help push the knot as close as possible to the bead, grasp onto the cord in one hand, along with the other cord on the other hand. Finally, pull them at the time time. Continue to add beads and knot between them. Follow the previous steps until you have used all but one of the 71 beads. Some people enjoy stringing on about six beads or so together, and then pushing them one at a time down the cords and knot. This way, they don't have to stop between each knot and add a bead. If you follow this method and end up having bead hole issues, double check that the bead does not slide over the previous knot before making the next knot. At this point, start knotting the ends together so you have a continued strand of knotted beads in a circle. Insert these through the hole of your last bead by taking the ends without the needles. If your ends are frayed, you can coat them with some glue first, allow them to dry, and then insert them. The glue will help stiffen the cord. In the same bead used in the previous step, insert the needle ends of the cords in the opposite end of the bead. Now you should have two doubled sections of cord crossing in opposite directions through the same bead. Taking one of these cords, tie an overhand knot around the stationary cord that is going through the beads. Then, insert the needle into the knot. As before, tighten the knot and push it up against the last bead. Repeat this on the other side of the last bead so that you have tied the knots on either side of the last bead with these cord tails. Finally, insert the tails through the next bead that is on either side of the last bead added. Use scissors to trim off the excess cord, and dab clear dried glue on the knots made in the last few steps on both sides of the last bead added. Once the glue is dry, you are ready to wear your masterpiece. Knotting takes extra time, especially if you have to work with bead holes that are less than symmetrical. The time to bead by hand is well worth it because you can't beat the unique quality of a finished beaded jewelry piece that has been hand-knotted. Slip on your no-clasp crystal necklace and enjoy.